Measurements of the surface tension have been carried out to determine the effects of both temperature and concentration on the surface tension of aqueous solutions of sodium chloride, propylene glycol, and ethylene glycol. A differential capillary-rise method was employed for the measurements. The results show that the surface tension of the ethylene glycol solution and the propylene glycol solution increases as the concentration of the solution decreases, while for the sodium chloride solution the surface tension increases monotonically as the concentration increases. 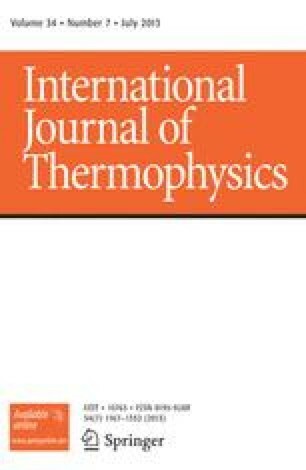 The surface tension of the liquids was found to be an almost-linear function of temperature from 20°C to just above the freezing temperature. Equations for the surface tension of the three binary aqueous solutions as a function of temperature and concentration are presented.